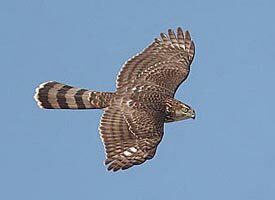 Two Coopers Hawks (Accipiter cooperii) have been spotted at the Centre over the past few weeks. Early in the morning they can be heard quite loudly as they cry while flying over the forest. Coopers Hawks are a forest bird. They are very acrobatic as they swerve between tree trunks and through the underbrush. Their feather patterns are a distinctive speckling and striping. Dark markings on a light base colour on their underside. We are hoping our two are a breeding pair and they might be setting up our grounds as a future nesting site. They might have some territorial competition from the Eagles though... so we will see how that plays out!